Custom Clamps & Brackets or ??? The addition of 9/16 studs provides an additional 30% increase in holding “pressure” on the head and therefore the head gasket. Higher compression ratios paired with an increased in blower boost can “squeeze” the gasket out between cylinders. Conversion to 9/16 studs acts as a safety measure to ensure you don’t miss a round of racing (well at least from a failed gasket). This jig ensures each hole will be precisely located and perfectly perpendicular to the surface of the block. 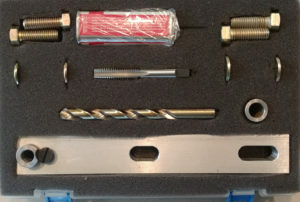 In assembling items for this kit I have requested, and paid more for, “Made in USA” components. Help our economy by doing the same. 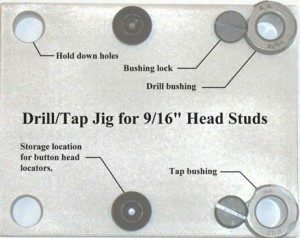 This kit includes a precision bored 3/4” thick aluminum jig, two button head locators, Slip Fixed (SF) drill and tap bushings, 31/64 drill, 9/16-12 3-piece tapping kit (taper, plug and bottom taps), (2) 1/2-13 hold-down bolts/washers, (2) 9/16-12 hold-down bolts/washers, anodized finish, storage case and complete instructions, including all the safety warnings you could care less about but should adhere to anyway. This kit does essentially the same as the kits noted above at a reduced cost. Custom ground bushings are becoming very costly. As an example, the bushing for a 9/16 tap is about $60 (2018). I am making my own bushings from cold rolled steel. They won’t last for hundreds of engines but will suffice for what we’re doing. If you work on all three brands, this jig will accommodate your needs. Kit comes with a 3/4″ or 1″ base plate, button locator, both drill and tap bushings, 31/64 drill, 9/16 tap, tapping fluid and storage container. For Head Studs see “Head Studs” under the “Product” drop-down. Tip: If you look at the head bolt locations you will notice the bottom row is close to the edge of the head/block while the top (intake) side is set further in. The row closest to the edge will exert more pressure and therefore pinch the gasket more. To provide for a more parallel (equal) gap between the head and block I recommend torqueing the bottom row studs approximately 20 ft. lbs. LESS than the top row. After 2-3 engine teardowns check the gasket thickness top and bottom and adjust torque if necessary. If you are reading this and use 1/2″ studs, use 90 ft. lbs. on the bottom and 105 on the top.